Gorgeous weather, delicious food, amazing scenery, and a great group were highlights of this year’s Baja California tour. Belding’s Yellowthroat was one of the few serious target birds we hoped to see, and it was one of the first birds on our first morning at the San José Estuary. Another hoped-for bird that showed well was the endemic subspecies of Northern Pygmy-Owl, which was mobbed by the endemic Xantus’s Hummingbird, providing for a very rare photo opportunity. The natural history of the Baja California peninsula is fascinating and beautiful. Rains earlier in the season had allowed for lush growth that attracted many butterflies, including this gorgeous Silver-banded Hairstreak. 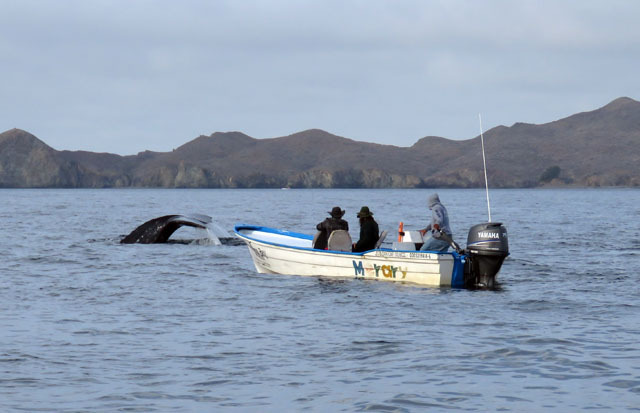 One of the highlights was our whale watching boat trip on Magdalena Bay. Several whales cavorted near our boats, and one even swam right underneath us only a few feet deep. The food everywhere was excellent, especially the perfectly fresh seafood. Here at Puerto Magdalena, the chef shows us our spiny lobster lunch that he was about to prepare, perhaps the best meal of the trip.